One of the most buzzed about restaurants of the moment, Same Same is adding another creative voice to Silverlake's already diverse food scene. An interesting mix of upscale wine bar and homestyle Thai cooking, the intimate-yet-modern space belies the traditional Thai cooking and flavors. The affordable wine list and extensive, eclectic menu are just a few of the draws of this already-acclaimed restaurant; finding a nice table during happy hour, ordering a glass of rosé and a few street food style dishes is pretty much the perfect post-work routine. 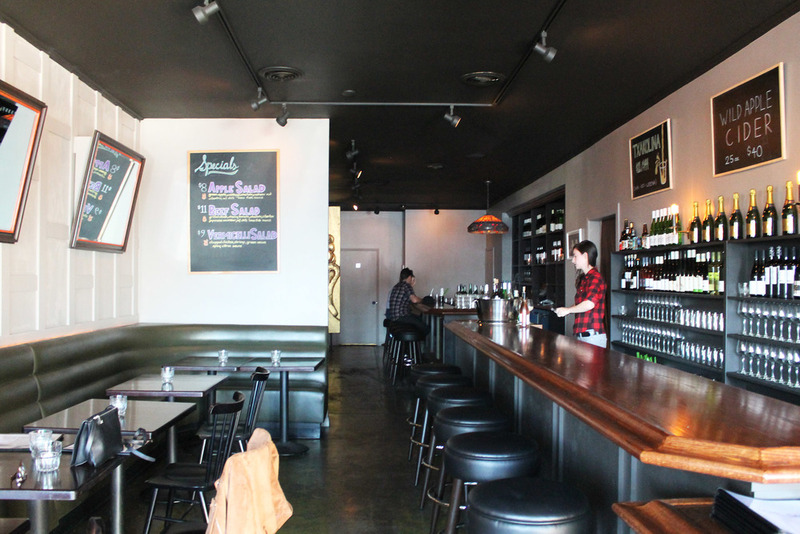 The interior is modern, but intimate; the leather boots and wood bar definitely say "wine bar" or "gastropub" instead of "Thai restaurant," but add a nice sense of intimacy and comfort. 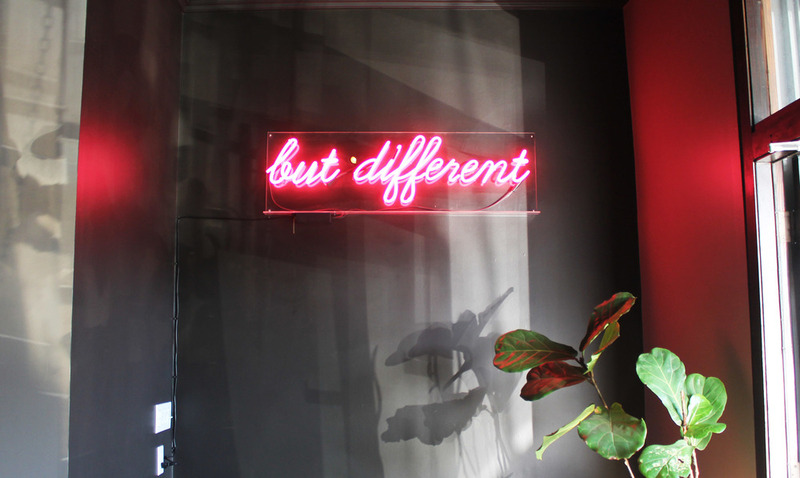 I'm already predicting their neon "but different" sign will be a big feature on Instagram over the next few months. Of course, we had to go with the currently on-trend glass of Rosé; nice, cool, and crisp, it paired really well with the spicy food. It seemed like a lovely, relaxing, and sophisticated way to start off the meal. To start off, we ordered the Sai Kork Esan, which is a Thai pork sausage. It's served with accoutrements like peanuts, raw onion, and cabbage. It was a great started; flavorful, with that nice snap on the outside, and just the right amount of heat. It was tempered nicely with the cool cabbage and crunchy onion. We opted for this Hot and Sour noodle dish, which featured rice noodles, shrimp, ground chicken, cilantro, onions, and more. The ground chicken and crushed peanuts added nice little bites throughout, while the noodles and shrimp were really satisfying. It definitely had quite a kick to it, but was nonetheless really tasty. Since a Thai meal doesn't really feel complete without a curry, we ordered the Green Curry with chicken. The coconut milk broth was really good; there was such a depth of flavor, balanced between a bit sweet and a bit spicy. The chicken was tender and perfectly cooked, while the eggplant was one of my favorite parts of the dish. Though it was a classic, hearty curry, it was surprisingly light and great over rice. I'm definitely a sucker for a good fried rice, so we went with the prawn version. Another dish with quite a kick to it, the rice itself was cooked so well. The prawns were also juicy and tender, while the garlic, peppers, onions, and basic added really nice herbaceous elements that elevated this from your typical greasy fried rice. If it wasn't for the spice, I feel like I could've kept eating this all night. We also ordered the mango sticky rice for dessert (not pictured), which was insane. It was really filling, but the rice was extra sticky and just sweet enough, while the mango cut through that nicely with a fresh element. Overall, the meal was great. It was such a perfect spot for meeting up with a friend, ordering some wine, and just hanging out with good food. I'm looking forward to going back and expanding my horizons a bit, experimenting with some more adventurous options that go beyond your standard traditional Thai dishes (like a Fried Mussel Pancake-- doesn't that sound amazing? ).